Today is the date of our creativity/business group meeting. Last month I had promised that I would get this blog up and running, so today is the day. I didn't get a gold metal for procrastination at the winter olympics for nothing, you know. But I have been busy on other fronts. 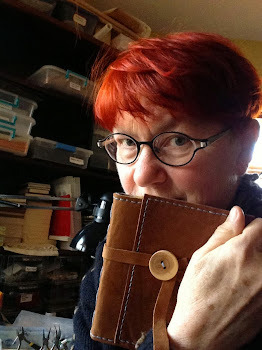 As some of you know (and I am assuming a lot from my reader out there) I am and always have been a feltmaker. A traditional, wet felting, lay it out, felt and dye it feltmaker. And I have been doing this for over 35 years. I have made some changes over the years - types of wool, dye processes and end products. Currently I am using fine merino needle punch batts from Australia to speed up the felting process as my true love is the resist dyeing that comes next. The resulting multi-colored resist dyed felt surface has been the canvas for my art. I would stitch, cut, restitch, bead, attach small collected objects, stitch again and finally frame the finished felt. In the beginning the resulting felts were huge, sometimes over 8 feet in one direction or the other. They started to get smaller as I realized that many people who wanted to collect my work would almost have to put an addition on their house to fit the artfelt. As I worked smaller, I realized I could work on a number of different ideas at the same time, different felts. Ideas manifested themselves - good and not so good - faster. What has happened over the last 35 or so years is that I have gone through many changes in the felt object - Large framed artworks, unframed giant felt walls, the wearables-slippers, hats, mittens, scarves, smaller artworks about collections, even smaller framed collections - and now I am at a very wonderful place with small 7" x 9" beaded, stitched and framed "pages", tiny beaded and felted brooches and dear to my heart - the feltbooks. 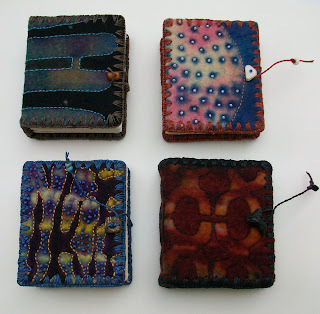 And even through I have been going down both paths of felting and book binding, I was still rather delighted with the January 2010 collision at their intersection when I finally just sat down at the desk in Studio A and made book after book after book - all with stitched and beaded felted covers and pure Lunar Laid text paper. They are making me very happy. I love your books! 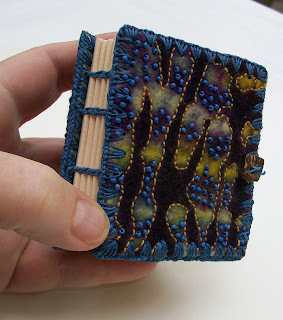 I too came to bookmaking late (I am a weaver) and I share your passion. Stitch on. Wonderful to see you here in bloggyland, Chad...YAY! one more place for me to keep an eye on your creations...it's one of the best sounding collisions at an intersection I've ever heard of! Good for you!! Welcome to the blog-o-sphere. I'll link to you immediately. The books are wonderful little pieces of art. Love them! Happy blogging, and I know I'll enjoy the reading a great deal. Your writing and your works make me smile often.